Described as the city “where Las Vegas meets Pyongyang”, nothing can prepare you for the desert mirage that is Ashgabat. Rows of marble-clad tower blocks descend down brand new (and empty) highways, flanked with gilded lantern posts. Immense monuments to Turkmen pride dot the city. The strange political system that keeps everyone in check makes you question everything you see and hear. Most importantly, you even start to question yourself. Verdant parks blossom in the middle of the desert. Fountains clatter joyously in the midday sun. But out on the street, people are nowhere to be found. Where is everyone? Magnificent and terrifying at the same time, Ashgabat is an unforgettable place. Judge them as you will, but the monuments to Turkmen grandeur should be the first port of call for any visitor to Ashgabat. 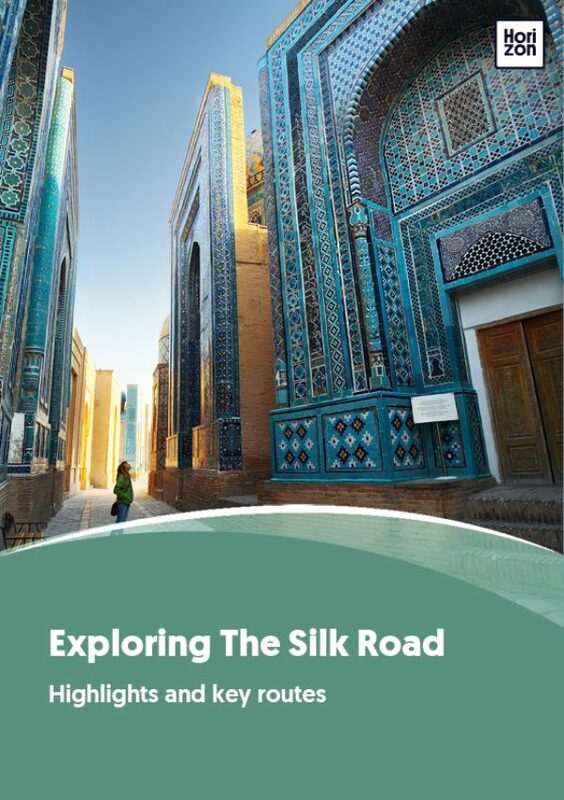 Highlights include the various monuments to independence, the Alem entertainment center and the golden statues of Turkmenbashi and his mad book Ruhnama. Taking the cable car up to the crest of the Kopet Dag mountains gives spectacular views over “The White City”. Ashgabat’s museums are not at all uninteresting, but still horribly overpriced. An alternative is to seek out the real life of Ashgabat. You would be surprised to learn that there is a buzzing heart to the city, located in the leafy old town, hidden away behind the new developments. The Russian bazaar is a great place to chat and bargain for Turkmen melons and cotton towels. Just outside of the city stands the somewhat blasphemous Kipchak mosque. Former president Turkmenbashi had the walls inscribed with the slogan “Ruhnama is a Holy Book – Qur’an is Allah’s book”. For those who prefer to see how the mighty have fallen, the nearby archaeological site of ancient Nisa shows a glimpse of the future. Ashgabat is located in a desert. Summer temperatures can easily exceed 40 degrees C (100s F). Dress light, and pack plenty of water. Turkmenistan’s first leader Turkmenbashi built golden statues of himself and renamed the months of the year after his relatives. The new leader, Arkadag, is a dentist. He loves cleanliness and the color white. You’ll see. Despite Ashgabat’s extravagant airport, there are not so many flights connecting it to the rest of the world: the main entry points are Moscow, Istanbul, Dubai and Almaty. There’s also a surprising Birmingham-Amritsar flight serving the British-Indian Sikh community that stops over in Ashgabat. Ashgabat is a city of extreme sprawl. You will need a taxi or private driver/transfers to get around. Like elsewhere in the region, relying on gypsy cabs is easiest: just stick out your hand by the side of the road and wait for someone to stop; it rarely takes more than a minute. Prices are higher, though, expect to pay $2-4 for a ride. If you intend to continue into Iran, count on six hours (including border procedures) to arrive in Iran’s holiest city, Mashad.